How to get there: First travel to Oppdal, a village along E-6, the main Hwy. connecting Oslo and Trondheim. Oppdal is 120 km south along E-6 from Trondheim. In Oppdal, take Hwy. 70 (direction Sunndalsøra) west 12 km. At this point, cross the bridge over the river from lake Gjevilvatnet, look for a building with the sign "Festa Kro" up on your right. Take the first (small) turnoff right after crossing the bridge. Park at Festa Kro, the coordinates are north 62:36.985, east 009:28.646, elevation 608 meter. An alternative, slightly higher trailhead is reached by turning off Hwy. 70 just before the bridge, the sign says Gjevilvatnet, from this turnoff stay left, cross the river on a bridge just upstream from the Hwy. 70 bridge, and continue gently uphill for 1.3 km (as measured from the Hwy. 70 turnoff). There is parking on your right and a sign pointing the way to Storhornet. This parking is, however, NOK 40 to be paid in a box (private property of the local farm). Route description: Starting from the lower trailhead (Festa Kro), make your way passed local "camping vehicles" and up across a farmers field (in summer, find a path or trail!) You will come up to the road that serves the upper trailhead. Follow it left a short distance until you may enter a field on the upper side, angle slightly right uphill and locate the trailfork with a sign for Storhornet and lake Gjevilvatnet. This is location, north 62:37.221, east 009:28.149, elevation 668 m. In winter, (possibly only late winter?) the winter route from here to the summit is marked with short poles, some bamboo, some red. The route heads uphill among private cabins, then further on the left side of a creek. Higher up, the terrain is more open along the route while the trees extend a bit higher on the right hand side of the creek. At about elevation 1000 meter, the vegetation ends and the slope levels off. Here, the route bends left (west), in order to enter the shallow valley with a creek that comes down from the summit area. The route climbs in this valley, staying quite close, but west of the south-east ridge. The route is more gentle between 1300m and 1400m, then climbs more distinctly to above 1550 m. The final 200 meter heads straight north to the summit. This route is uphill from the start to the end. However, the hill is quite gentle. There are no steep sections or any difficulties. Comments: I started at around 1120 and arrived at the summit about two hours later at 1320. It was snowing, the wind was strong enough to call for a jacket, but not really a problem. The visibility was rather limited, perhaps 50 meter on average. I looked down the steeper side to lake Gjevilvatnet and tried to take a picture of the cairn and a small (stone?) 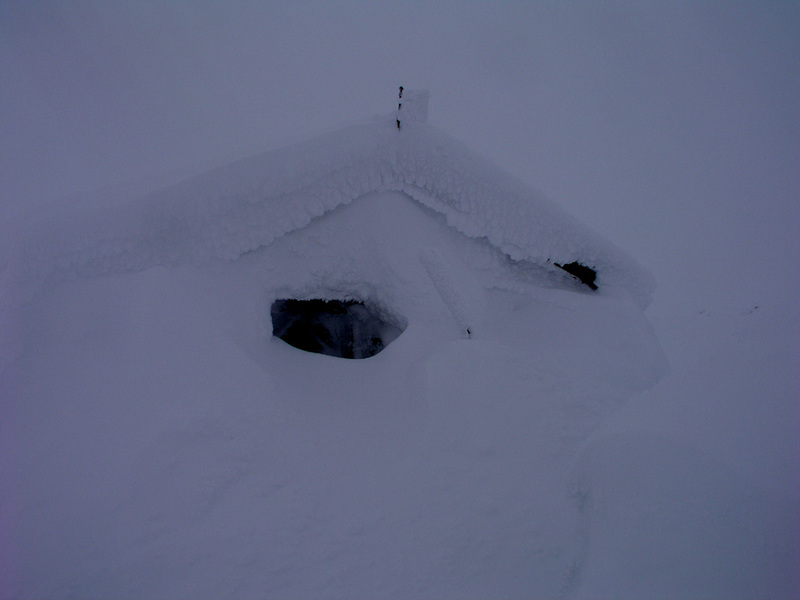 hut at the summit. The conditions were "whiteout", so not much to do. I headed down after 10 minutes and arrived back at the car at 1400, a single, continuous downhill. 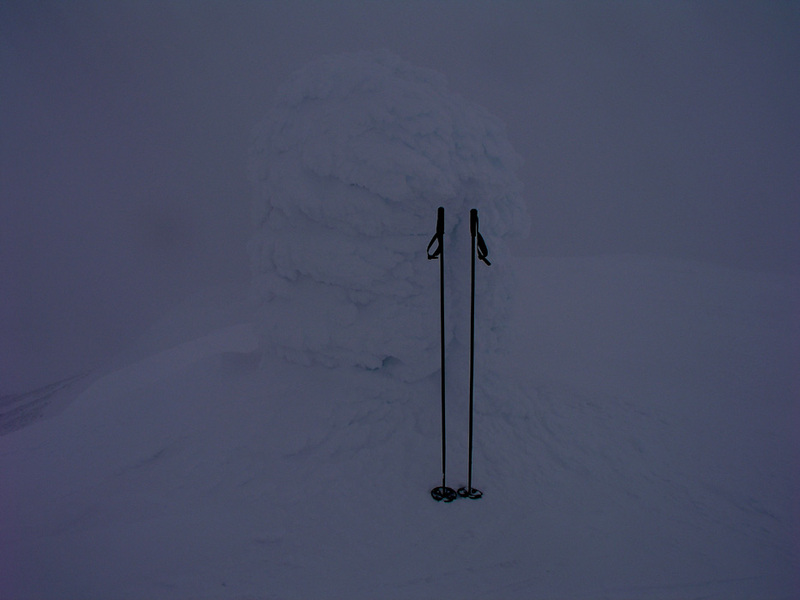 The light was all "flat" and I had to ski rather slowly, given the conditions and being solo. On a nice day, the return ski may be quite fast indeed. The view from this summit is supposed to be nice, well some peaks must be climbed under less than perfect conditions or there would be few trips indeed. Storhornet, the summit is far right. The summit hut on Storhornet. Oppdal panorama, this is from Vangslia and the view is south (large file).